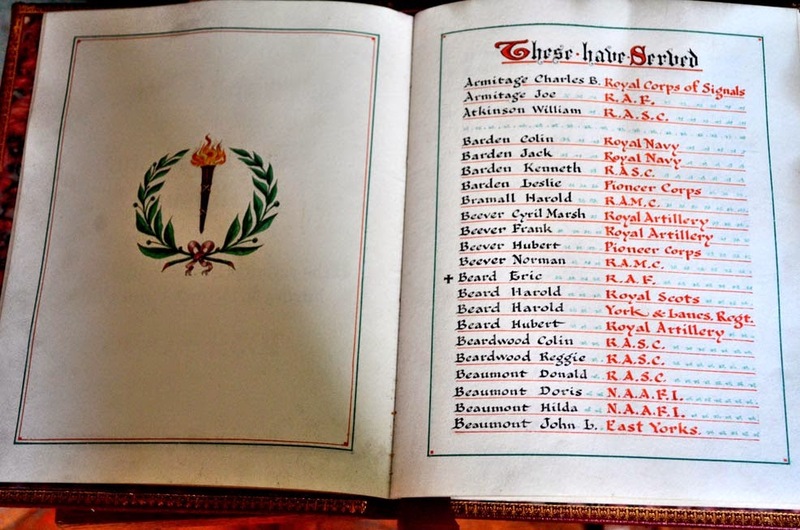 This book is situated in a niche to the right of the WW1 memorial plaque. Hey Arthur York and Lancaster Regt. Beard Harold York and Lancaster Regt. Beaumont John L. East Yorks Regt. Booth George Duke of Wellinton's Regt. Brocklehurst Fred Yorks and Lancaster Regt. Burton Horace Royal West Kent Regt. Colbridge William Duke of Wellinton's Regt. Durrans Paul H. Duke of Wellinton's Regt. Goldthorpe Jack Royal tank Regt. Jones Sidney Duke of Wellinton's Regt. Latimer Graham West Yorks Regt. Robinson Arnold Royal Scots Fus. Shaw Irwin Duke of Wellington's Regt. Snape Charles Duke of Wellington's Regt. Simpson Gordon York and Lancaster Regt. Simpson Fred East Yorks Regt. Shirtcliffe John York and Lancaster Regt. Stocks Arnold York and Lancaster Regt. Turner William South Staffordshire Regt. Waring Jesse York and Lancaster Regt.